Michelle Waldron of Holt Hill Bears got the passion for teddy bears early on. 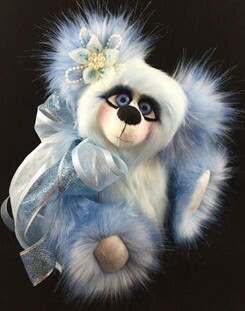 Growing up in Texas, she started this love affair with a childhood bear named 'Blue' and by the age of 10, was an avid collector. "I started collecting manufactured bears and had wonderful shelves in my room full of all kinds of bears." 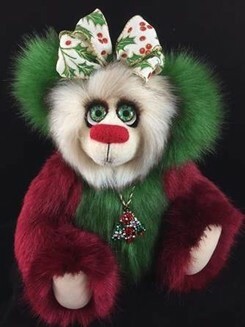 As she grew older, she continued to collect them through her high school and college years, and was later introduced to artist bears. "Because of this connection with teddy bears, I joined a teddy bear club called The Teddy Bear Patrol, a non-profit organization supporting neglected children and families through donated teddy bears. We gathered bears and donated them to assist in efforts to comfort families and as a member, I met so many others that also loved teddy bears; many who were actual artists designing and creating their own bears." 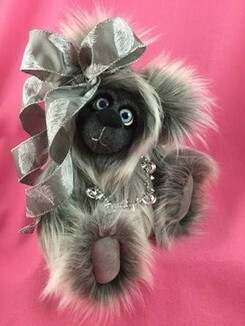 The organization brought in speakers from manufacturing companies like Hermann, Steiff and Stearnsy and introduced Michelle along with the other members, to how the teddy bear got started and their presence in the industry. "We had a lot of great times and it was wonderful getting to know all the artists. It was then that I learned the difference between the manufactured and artist bears," she said. Through the club, Michelle was introduced to the world of 'in-person' teddy bear shows. 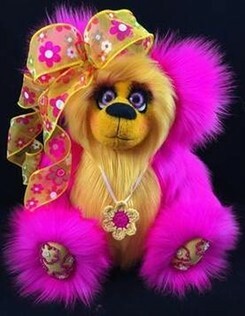 When she attended her first show; "I was amazed at all the creative, unique and beautiful bears that each artist designed. I met so many people and learned how they got started in business. 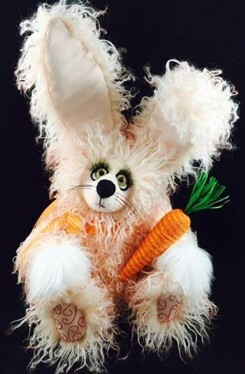 Inspired by their stories, I bought my first artist pattern and fur." 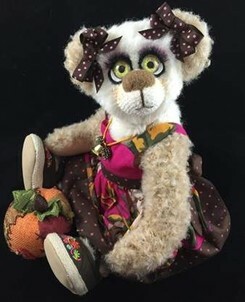 Although she procrastinated for quite some time in the making of the bear, Michelle spent time reading more about what was involved in creating bears and worked her way through tutorials. "I consider myself mainly self-taught in this wonderful art," she confided, and continuing, "In my family there was a lot of creating going on through crafts like sewing, beading and cross stitching, just to name a few. All this helped me so much with my creativity." 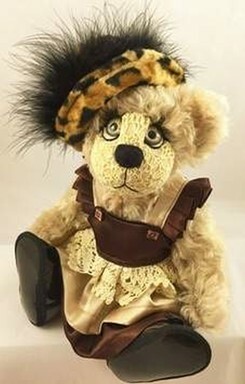 Michelle sells her bears and buds at shows, online and through her website, and participates in online shows. 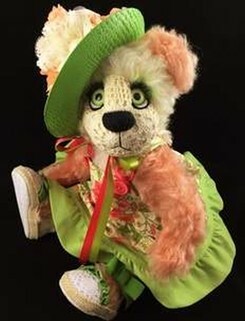 She even has one of her bears in a museum in Brenham, Texas on display. Her ability to sell online fits her active life. 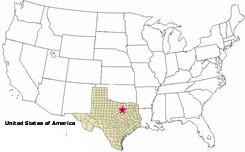 Michelle works full time, has a daughter in college and she and her husband share their Hurst, Texas home with four energetic dogs and a cockatiel bird. She squeezes part of her bear-making into her workday by using her lunch hour to sew. 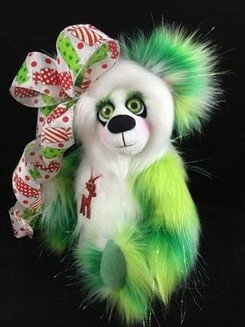 Her favorite part of creating is coordinating the fur colors and working on faces. "I want to make sure each of them have a unique expression that brings out each of their personalities. You have to put your heart and soul into them." And Michelle's heart is as big as Texas. 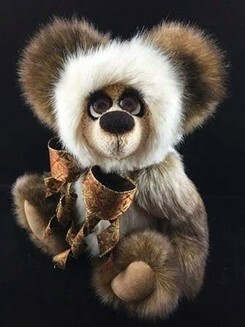 "My passion for teddy bears, and all the wonderful friends I have made along the way, has helped me learn and grow, and has given me such a great love for this art. Everyone has creativity within them and having a heart for bears has shown me how a dream has turned into reality for me. 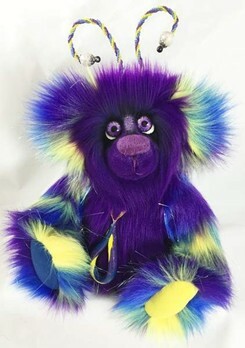 Bear designing, creating and collecting (or what one chooses to collect), should always touch your heart and brings you joy. It is an addictive art, and once you start creating bears, you will never stop. The love of bears is very unique and special, they bring out the best that is within us. My motto is and always will be 'Between Love and Joy is the Teddy Bear'."